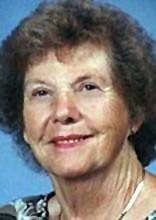 CEDAR FALLS, IOWA - Wanda A. Abbe, 86, of Cedar Falls, died Sunday, June 17, 2012, at Elizabeth E. Martin Health Center of Western Home Communities. She was born April 30, 1926, in Waterloo, Iowa, daughter of Franklin B. and Lillian Schmock Stoner. She married Marshall Abbe. He died in 2004. Mrs. Abbe was a restauranteur for 45 years, retiring in 1995. She and her husband owned and operated the Colony Club, Waterloo, and were members of First Presbyterian Church, also in Waterloo. She was Noble Dame of the Waterloo Elklets and past president of the Franklin Gateway Neighborhood Association. Wanda is survived by a son, Ron (Kay) Johnson of Fort Myers Beach, Fla.; a daughter, Lisa Abbe of Waterloo; and six grandchildren. She was preceded in death by a son, Marshall II "Skip." Cedar Falls, where there will be a 6 p.m. service, with entombment in Garden of Memories Mausoleum, Waterloo. Condolences may be left at www.richardsonfuneralservice.com .